Red clover, Trifolium pratense is one of my favorite herbs for gynecology, treating cancer and detoxification. The part used is the flowering top picked as soon as the dew has dried, with care not to bruise the flowers. It grows in moderate climates. Russians recommend the herb for bronchial asthma, and it is widely used for respiratory issues. The Chinese use the tea for respiratory infections with dry cough. Energetically red clover blossoms are cool, sweet, with a mineral saltiness that makes them slightly moistening. The flower is classified as an alterative which means it encourages nonspecific elimination of the organs. It is also a lymphatic tonic. This makes it useful for detoxification and in cancer treatment. It is slightly demulcent since its minerals attract moisture to the throat and bowels. On the other hand it is slightly expectorant. Red clover is a source of many valuable nutrients including protein, calcium, chromium, magnesium, niacin, phosphorus, potassium, thiamine, and Vitamins A and C. There are a number of isoflavones which can affect the hormones including daidzein, geneisiten, formononetin and biochanin A. Flavonoids which are antioxidant include trifoliin and calycosin. There are courmarins but this is not a concern for humans so long as the flower is not fermented: in ruminant animals like cows however there may be blood thinning with excessive use. Red clover has a long history in Western herbalism. It has been used in Europe, the Americas, Africa and parts of Asia. It has been used in a number of alterative formulas. 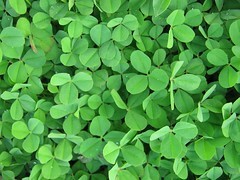 In the US, Parke Davis made Trifolium Compound which was used for cancer treatment, especially breast, lung and lymphatic cancers, malignant tumors, as well as skin conditions and arthralgias. The Eclectic Doctor Harvey Felter said it did not “cure” cancer but patients who took it after cancer surgery had less frequent and aggressive recurrences. Jason Winters tea, containing red clover and chaparral and some unidentified secret spice, sells at rather high prices as a “cancer cure.” It is also found in the 8 herb version of Essiac tea for cancer, improving the original formula. Far more effective is the Hoxsey Formula which is based upon the Trifolium Compound. It is posited that the phytosterols in red clover may block estrogens by locking into the receptors. It is not exactly true to call the plant compounds phytoestrogens and expect that they will act like the stronger human hormones. While you may find sites on the web that caution red clover can cause proliferation of cancer cells, this theoretical concern ignores centuries of use against cancer. The isoflavones in red clover may also counteract cancer recurrence. A study of nearly a thousand women suggests that red clover may interfere with an enzyme known to promote the progression of endometrial cancer. Similarly red clover may also block enzymes that contribute to prostate cancer in men. It has limiting effect in the development of benign prostate hyperplasia (BPH), a non-cancerous enlargement of the prostate gland. The 19th Century popular herbalist Samuel Thompson used red clover topically as a poultice and salve for treating skin cancer, eczema and dermatitis. David Winston uses red clover internally for ovarian cysts, fibroids, and mastitis with scrophularia, prunella, and fritillaria bulb. It is a lymphatic tonic that can work on swollen lymph nodes and fibrocystic breasts. Swellings due to mononucleosis or chronic fatigue may respond as well. My favorite way to use red clover is in overnight infusions. I take half ounce to an ounce of red clover and pour a quart of boiling water over it, cover the pot and let steep overnight. In the morning I squeeze out the tea, pour into a water bottle and drink over the day. Overnight infusions give maximum mineral content, unlike tinctures so are more nourishing. I have heard a group of women tell herbalist Susun Weed how she “knocked them up” by using overnight infusions to help their fertility. Gail Faith Edwards mixes red clover, red raspberry, wild grape leaves and tendrils in a fertility tincture. My own clients find that their skin clears, they feel more alert and then they conceive. Red clover is also useful for osteoporosis due to its mineral content and phytosterols. It should be taken with Vitamin D for this purpose. Menopausal hot flashes may also respond to red clover, especially when mixed with yin tonics like shatavari and rhemannia. James Duke recommends red clover as a food. He claims that the best vegetable bouillon he ever made consisted of red clover and chicory flowers, boiled vigorously with wild onion and chives. I like to make a soup using the overnight infusion with an organic soup bone, sauteed leeks and a handful of dried nettles. Red clover is a food and a medicine. However you take it, the herb is safe and nutritious.